Rise The Dust are sure to get the weekend off to the right start as they provide the music for our Opening Ceili on Friday night, which takes place in The Backyard Culture Centre–directions can be found at http://www.backyardartcentre.com/contact-us.php . Have a listen to Rise the Dust Ceili Band at Dun na Sí Heritage Centre, Moate, Co Westmeath with the Plain Set. 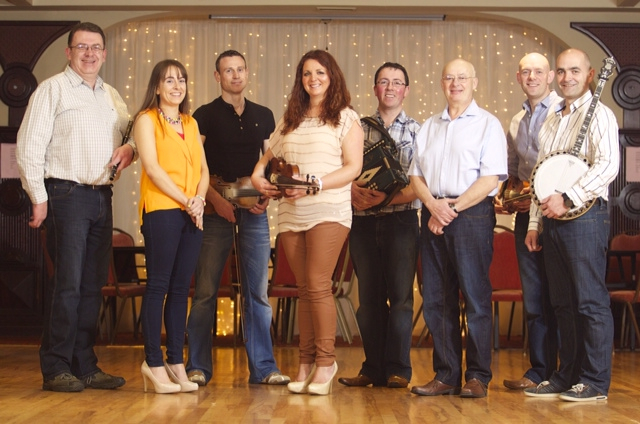 On Saturday night in The Cavan Crystal, Striolán Ceili Band will be on stage for our Ceili at 9pm. Listen to them here playing for the Connemara Set at the Monday afternoon ceili at the Armada Hotel’s Set Dancing Week, July 15th 2012. On Sunday afternoon, again in The Cavan Crystal Hotel,Shaskeen Ceili Band, under the direction of Tom Cussen, will be on stage at 2.30 play for our Sunday afternoon Ceili. Have a listen to them here playing a selection of reels. This year we are delighted to have the internationally renowned Mick Mulkerrin providing some of the tutorials for us. Here he is seen with Mairéad Casey at The Willie Clancy Summer School in 2005. Here we have Kathleen McGlynn and some of her “students” doing a Sean Nos dancing demo, while Micheal McGlynn is calling the steps. Here we see Kathleen at a past Dancing in The Drumlins event in Cavan, leading a group of enthusiasts as she demonstrates a selection of steps. Cavans own Marian Crowe has worked tirelessly over the years to promote Set Dancing and Sean nós Dancing in Cavan and holds classes each Wednesday night in The Backyard. 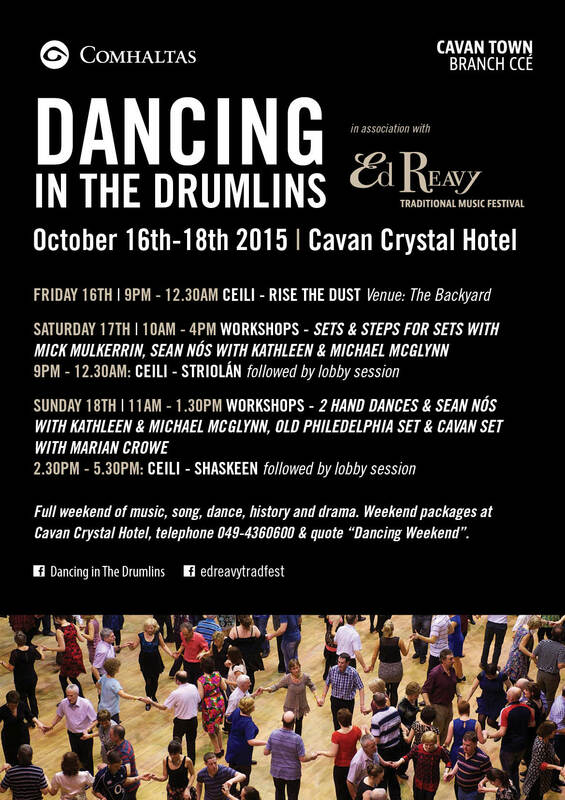 As one of the key organisers for The Dancing in The Drumlins event, Marian will be holding a number of workshops across the weekend covering dances such as The Cavan Reel Set and other local steps. On Sunday morning, Marian along with others including Mary Reavy, will demonstrate The Old Philadelphia Set. Marian is seen here dancing a few steps to the lilting of Seamus Fay at a past Dancing in The Drumlins event in The Cavan Crystal Hotel. Come along to Cavan and make a weekend out of it. See all the other events being run as part of the combined Dancing in The Drumlins and Ed Reavy Traditional Music Festival Weekend.